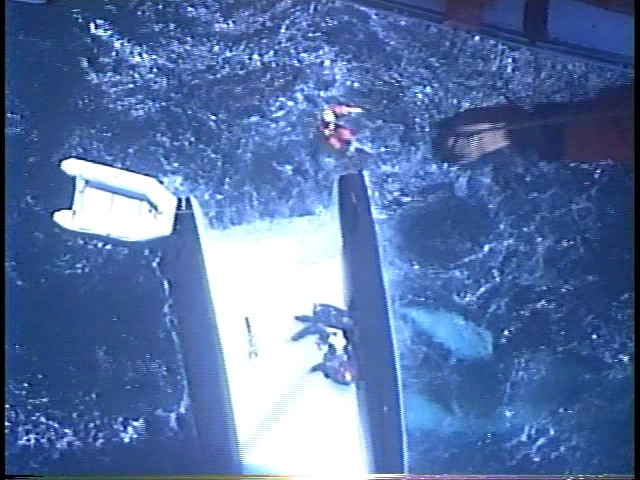 The USCG Group Humbolt Bay rescued 3 from the 32-foot catamaran, Cataylist on Saturday July 3rd, 2010. The vessel was transiting from Crescent City to Alameda, California, when it encountered rough sea conditions as reported in D11.USCGNews.com. The crew activated the EPIRB (Emergency Position Indicating Radio Beacon) in stormy seas, just minutes before a set of massive waves capsized the vessel, with 50 knot winds and 20 foot + waves knocked the boat completely upside down, pinning all three underneath. Once the EPIRB was activated, the USCG used the registration information from the beacon to contact the family of the vessel’s crew. The crew had left a float plan with the family. The float plan information included a description of the boat, number of passengers aboard, a description of the safety equipment aboard, destination and estimated time of arrival. “The float plan allowed us to confirm information about the vessel, create a better plan and expedite our search,” said Lt. George Suchanek, an MH-65C Dolphin helicopter pilot that responded to the call. After escaping the overturned vessel, the three crew members were clinging to the hull while in the frigid Pacific waters 20 miles off Fort Bragg on the Northern California coast. The US Coast Guard helicopter was able to home in on the signal given by the EPIRB and retrieve the crew with the help of a rescue swimmer, hoisting them aboard the helicopter. All three sailors were showing signs of hypothermia. “That EPIRB saved their lives,” stated USCG Lt. George Suchanek. PLB’s (Personal Locator Beacons) and EPIRB’s (Emergency Position Indicating Radio Beacon) offer a measure of safety when all else has gone wrong. The ability to be found alive and fast can make the difference between life or death when in the cold waters of an unforgiving storm. An EPIRB‘s signal can be turned on in an emergency to transmit the GPS position and identity of the vessel along with other information to a network of satellites orbiting the earth. The USCG monitors all EPIRB activations. For the full length Video’s from the USCG, see below. New EPIRBs and PLBs from GME! Go2marine carries GME EPIRBs (Emergency Position Indicating Radio Beacons) and PLBs (Personal Locator Beacons), which are designed to transmit an internationally recognized digital 406 MHZ distress signalwhen activated. They are designed to communicate to rescue services such as the Coast Guard, when nothing else will work. Rescue Beacons have a self sufficient power source that is able to function in the most rugged conditions for a minumum of 48 hours (Epirb) or 24 hours (PLB). Uniquely, EPIRBs and PLBs may be used anywhere on earth, but, they are typically designated in their use in certain environments. EPIRBs tend to be larger (due to larger battery) and are used in the marine environment only. They come with a leash to tie them to a raft of vessel. They are waterproof and float. EPIRBs are typically assigned to a vessel. PLBs are smaller, used on land (or water), battery life is not as long as an EPIRB. GME PLBs are waterproof and float. PLBs are intended for personal use, away from normal emergency services. Additionally, all GME EPIRBs or PLBs are offered in versions that come with or without GPS to augment the satellite fix. The addition of GPS to any of these emergency beacons will increase location accuracy while reducing wait time for rescue. AccuSat is made in 4 variations of a well designed EPIRB (Emergency Position Indicating Radio Beacons). All EPIRBS include a self testing facility allows the beacons functionality to be tested without fear of accidentally transmitting a distress signal. Additionally, the test actually measures the transmitters power output, not just the battery condition. The AccuSat Class 2 EPIRB is available in two deployment styles; manual release or automatic hydrostatic release. Fitted with long life batteries capable of retaining up to 90% of their original Amp Hour capacity after 10 years. Safety seal which serves to indicate that the beacon has never been turned on and the batteries have not been used. Extended GME warranty, 6 years on the battery and unit. GME Electrophone has full service and maintenance facilities to maintain your beacon and provide recertification where required. The MT410 GME AccuSat PLB (Personal Locator Beacon) is the smallest & lightest PLB rescue beacon currently made. Additionally, the MT410 offers the industries longest warranties; a 7 year battery replacement life and a 7 year operational warranty. Design features such as a ‘Non Hazmat’ battery pack for simple and cost effective transportation as well as a high intensity flashing LED all contribute to this quality safety equipment. GME has been designing and manufacturing rescue beacons for over 30 years in Australia for boaters, bush walkers, 4 x 4 enthusiasts and aviators should they ever require emergency assistance. ALL GME rescue beacon EPIRBs and PLBs can be user tested once a year without impacting battery life. The USCG and NOAA have issued a notice that 121.5 and 243 MHz emergency beacons will no longer be monitored by satellite after February 1, 2009. This is an international agreement that 406 will be the only recognized satellite emergency signal. NOTE – – Pilots are reminded and encouraged to monitor 121.5 MHz from their cockpit to listen for other aircraft that may be in distress. 406 EPIRB Frequencies will continue as the primary satellite rescue frequency. Please ensure that you are indeed using a 406 EPIRB (Emergency Position-Indicating Radio Beacons) or PLB (Personal Locator Beacons). Go2marine only carries 406.037 MHz, EPIRBs and PLBs from recognized manufactures such as ACR, Mcmurdo and Spot, that are approved by COSPAS-SARSAT, R&TTE, or the FCC. Go2marine also sells EPIRBs that are certified to pass the country of origin for any international vessel. The 406 MHz EPIRB was designed to operate with satellites. The signal frequency (406 MHz) has been designated internationally for use only for distress. Other communications and interference, such as on 121.5 MHz, is not allowed on this frequency. Its signal allows a satellite local user terminal to accurately locate the EPIRB (much more accurately — 2 to 5 km vice 25 km — than 121.5/243 MHz devices), and identify the vessel (the signal is encoded with the vessel’s identity) anywhere in the world (there is no range limitation). These devices are detectable not only by COSPAS-SARSAT satellites which are polar orbiting, but also by geostationary GOES weather satellites. EPIRBs detected by the GEOSTAR system, consisting of GOES and other geostationary satellites, send rescue authorities an instant alert, but without location information unless the EPIRB is equipped with an integral GPS receiver. EPIRBs detected by COSPAS-SARSAT (e.g. TIROS N) satellites provide rescue authorities location of distress, but location and sometimes alerting may be delayed as much as an hour or two. These EPIRBs also include a 121.5 MHz homing signal, allowing aircraft and rescue craft to quickly find the vessel in distress. These are the only type of EPIRB which must be certified by Coast Guard approved independent laboratories before they can be sold in the United States. A new type of 406 MHz EPIRB, having an integral GPS navigation receiver, became available in 1998. This EPIRB will send accurate location as well as identification information to rescue authorities immediately upon activation through both geostationary (GEOSAR) and polar orbiting satellites. These types of EPIRB are the best you can buy. 406 MHz emergency locating transmitters (ELTs) for aircraft are currently available. 406 MHz personnel locating beacons (PLBs) are available. The Coast Guard recommends you purchase a 406 MHz EPIRB, preferably one with an integral GPS navigation receiver. A Cat I EPIRB should be purchased if it can be installed properly. The major advantage of the 406 MHz low earth orbit system is the provision of global Earth coverage using a limited number of polar-orbiting satellite. Coverage is not continuous, however, and it may take up to a couple of hours for an EPIRB alert to be received. To overcome this limitation, COSPAS-SARSAT has 406 MHz EPIRB repeaters aboard three geostationary satellites, plus one spare: GOES-W, at 135 deg W; GOES-E, at 75 deg W; INSAT-2A, at 74 deg E; and INSAT-2B (in-orbit spare), at 93.5 deg E. Ground stations capable of receiving 406 MHz. Except for areas between the United Kingdom and Norway, south of the east coast of Australia, and the area surrounding the Sea of Okhotsk near Russia, as well as polar areas, GEOSAR provides continuous global coverage of distress alerts from 406 MHz EPIRBs. Note that GEOSAR cannot detect 121.5 MHz alerts, nor can it route unregistered 406 MHz alerts to a rescue authority. GEOSAR cannot calculate the location of any alert it receives, unless the beacon has an integral GPS receiver. COSPAS-SARSAT is an international satellite-based search and rescue system established by the U.S., Russia, Canada and France to locate emergency radio beacons transmitting on the frequencies 121.5, 243 and 406 MHZ.